You just can’t miss the crazy-stylish clothes in Crazy Rich Asians, can you? Rachel couldn’t help but notice the enormous canary diamond flashing on her hand like a translucent egg yolk, and the pair of three-carat solitaires in her earlobes, identical to Peik Lin’s. Like mother, like daughter—maybe they got a two-for-one deal….Rachel quickly registered two versions of the Venus de Milo, one in white marble, another in gold, of course. There was a huge round dining table that seated eighteen comfortably covered with a heavy Battenberg lace tablecloth and high-backed Louis Quatorze chairs that were, thankfully, upholstered in a royal blue brocade. So naturally, an avid reader and cinema fan like me would expect the film adaptation of Crazy Rich Asians to feature striking fashion that brings Kevin Kwan’s vision to life. 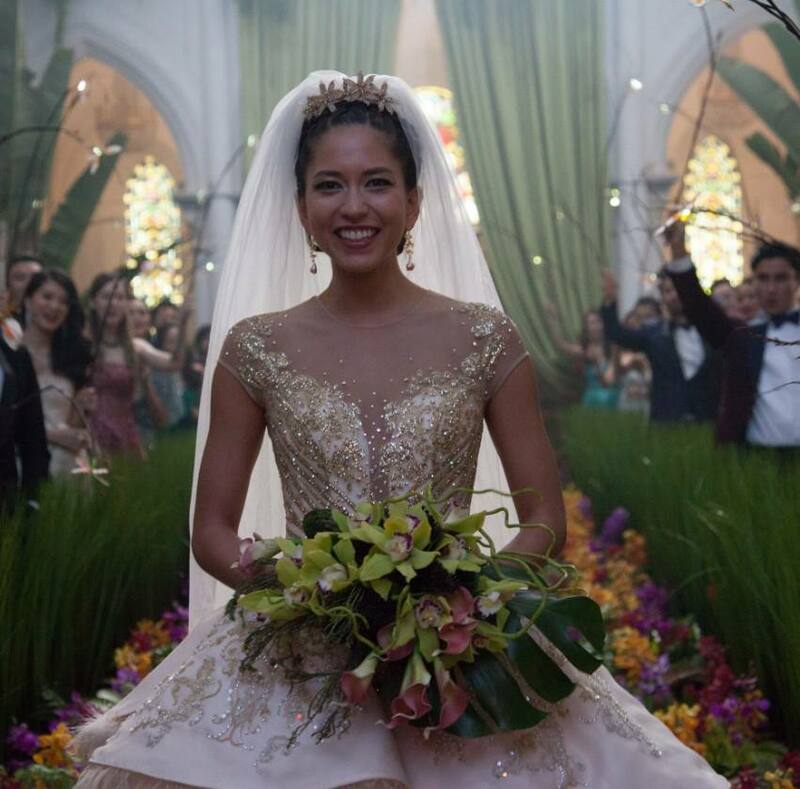 Set amidst the ultra-glam world of uber rich Singaporeans (the kind who spend $40 million on weddings), Crazy Rich Asians features classy settings, and lots of high fashion and haute couture clothes, but with a strong Asian touch. Costume designer for Crazy Rich Asians Mary Vogt along with Andrea Wong (consultant and senior costume buyer) sourced clothing from a range of designers, such as Ralph Lauren, Elie Saab, Dolce & Gabbana, Stella McCartney, Valentino and Dior, along with several Asian designers. The actors in the film wear clothes suited to the Asian sensibility, and style themselves according to Asian standards of style and beauty. Which means you will be delighted and surprised to see fashion choices most Hollywood actors would not make on-screen. 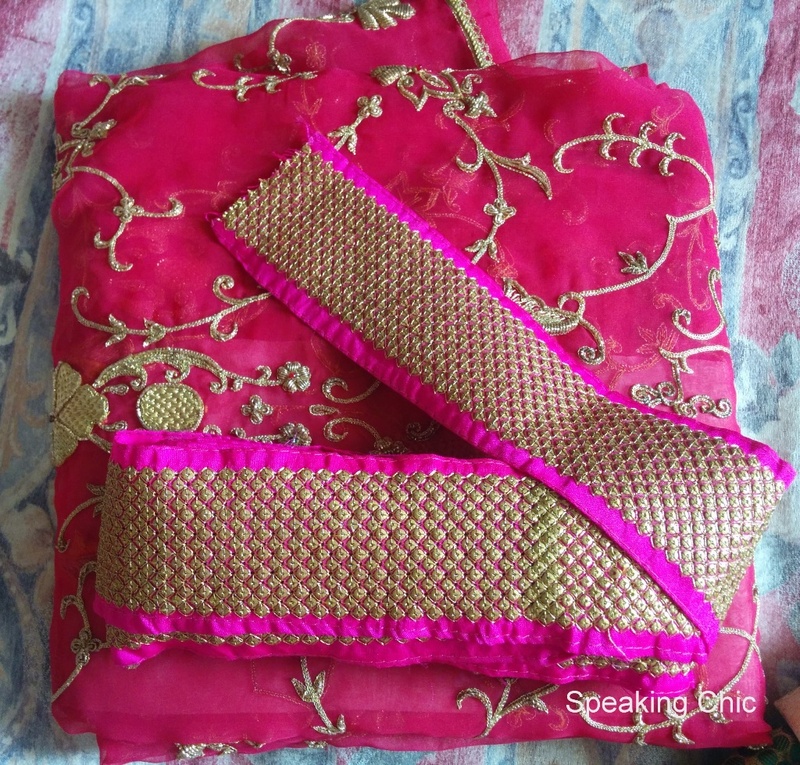 In most of Asia (including India), fashion, accessories, jewellery and makeup choices are as much about aesthetics as they are about showing your wealth. In most western cultures including Hollywood, less is generally more, but in Asia, the rule is “less is too less, go for more”. Hence you will see multiple accessories in a single look, splash of colours and embellishment, and daring prints. Peik Lin is quirky and funny, she knows it, and she dresses for it. In a sea of Singaporean Asians with long, dark hair, she chooses to go short and blonde. This spunky gal also dresses like she doesn’t care. Her outfits feature quirky prints, bold colours and mix-and-match separates that seem to be just thrown together in the morning. But that doesn’t take away from the fact that Peik Lin is a fashionista in her own way. She has a closetful of pricey designer dresses, and she carries multiple outfit and accessory options in the trunk of her car for fashion emergencies like a sudden cocktail party invitation. Rachel Chu is a New Yorker, so her signature style is laidback and casual. As an economics professor and humble upbringing, she doesn’t care much for high fashion. Even when thrust into the world of crazy rich Singaporeans, Rachel maintains her style sensibilities and sticks to her simple aesthetic style. Meeting with her boyfriend’s mother and grandmother? An “auspicious” red dress. All-expenses-paid shopping spree? An understated cotton outfit. But her dear friend Peik Lin helps her up her fashion game when it’s time for Rachel to show she can be classy too. Peik Lin chooses a multi-hued shimmering gown for the first meeting with the formidable mother, and a baby blue tulle Marchesa dress with a tiara for a grand wedding. In a critical moment in the film, Rachel opts for a game of mah jong with her boyfriend’s mother Aunty Eleanor. In this scene, Rachel shows Aunty Eleanor what a New York gal can really do. Dressed in a flattering floral print dress paired with subtle makeup, Rachel stuns Eleanor with her grace and class in terms of style and as a human being. As one of the richest women in Asia, Eleanor Young (played by Michelle Yeoh) epitomizes elegance in every frame. As a woman with impeccable manners and taste, her fashion choices are always accurate and her looks are perfect down to the finest detail. My favourite Aunty Eleanor look is the cocktail party at her mother-in-law’s home. She wears a pleated burgundy floor-length Valentino gown with a gorgeous brooch and matching earrings. Her hair is in a classic updo and her makeup is just right. Perfection! Astrid is an heiress with a passion for all things rare and beautiful. She has an eye for vintage, a big heart and a contemporary outlook. On ordinary days, she wears silk blouses with high-waist trousers, form-fitting dresses and loads of oomph. My favourite Astrid look is her introductory scene- a stylish Dior dress with a high draped collar, oversized sunglasses and a cute designer handbag. Which is your favourite look from Crazy Rich Asians? 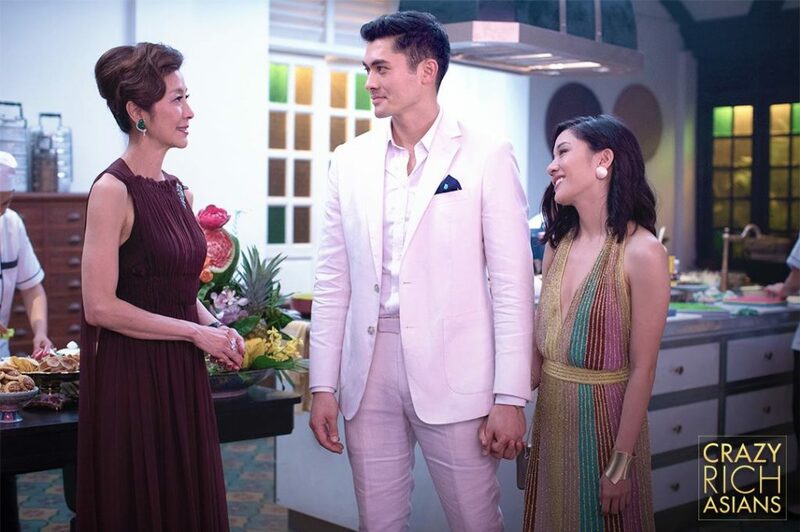 All pictures courtesy Warner Bros (from Crazy Rich Asians official Facebook page). An extra marital affair, small town gossip, an annoyed domestic help and a seemingly-innocent housewife are blended expertly to create the intriguing story of Chutney. As the special chutney recipe is revealed, the home-grown green chillies are not the only secret ingredient we discover. Tisca Chopra’s performance is stellar as she shares her recipe and narrates a sinister tale. Meanwhile, I’m craving samosas with spicy chutney. Watch Chutney here if you haven’t seen it already. La La Land is a delightful musical journey. Even several days after watching the film I couldn’t get City of Stars out of my head. Aside from the breath-taking view of Griffith Observatory and the Hermosa Beach pier, I was taking mental notes on the costumes. There was none of the sloppy-but-standard jeans and tee combos for the sweethearts. 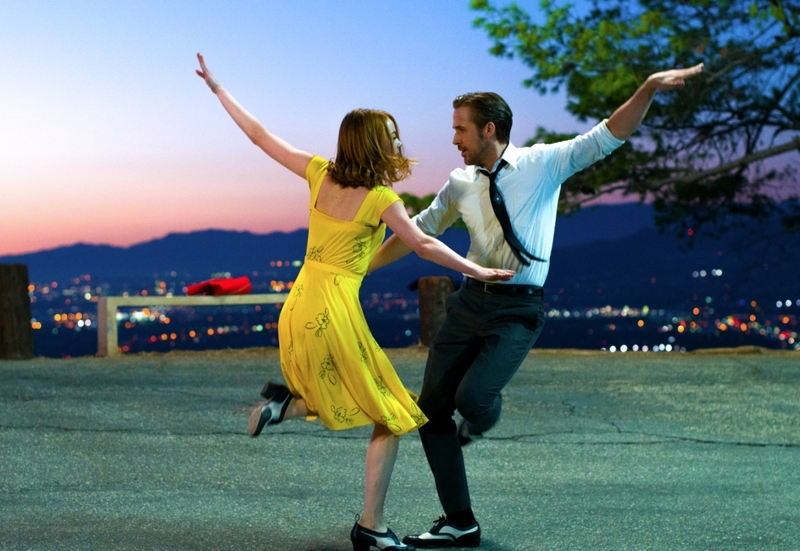 Emma Stone’s chic and flattering dresses in solid yellow, blue, peach and green have given me major fashion goals, while Ryan Gosling’s always-dapper look should hopefully inspire gentlemanly dressing. Last week was Earth Day. I usually don’t pay much attention to such “days” because most of them are mere eyewash, but Earth Day got me thinking. Can I really make a difference in building a better future for a greener planet? I assessed my passions (fashion, food and travel) and I figured- sure, I can make an impact, and quickly sat down to make a rough list. At the end of an hour, I re-read the list and scratched out a few unfeasible ideas. But a handful of practical and pragmatic earth-friendly ideas survived. An inner voice said, “Hey, this can work!” So I decided to take the list public and share it with you all. Shop within a limit. And I don’t mean your credit card limit. Plan your shopping and decide what you need to buy before you head to the mall. Even with just a dozen tops and half a dozen pants, you can be trendy and stylish. Sure, end of season sales are tempting and a wonderful excuse to buy the orange top or pink dress on your wishlist, but do you really need Blouse No. 52 in your wardrobe? Instead, do a thorough wardrobe cleanse over a long weekend, then only add new clothes and accessories to replace an older one that’s worn out. Buy locally-made clothes. Here’s how the supply chain of most fast fashion brands (like Zara) usually work: Clothes are manufactured in Country A, then sent to home country and dispatched around the world. Or the garments are shipped directly to warehouses or stores in Countries B, C, D and so on. Working on tight deadlines and short turnaround times, manufacturers often dispatch the merchandise via air. With hundreds of manufacturers and dozens of countries, you can imagine the amount of emissions a single brand’s business could generate. A simple thumb rule (broad generalization): the shorter the distance a garment travels, the more planet-friendly it is likely to be in terms of emissions. Buying clothes made in another part of the world may often be the easier (read: cheaper) option, but do try to opt for a local brand when possible. 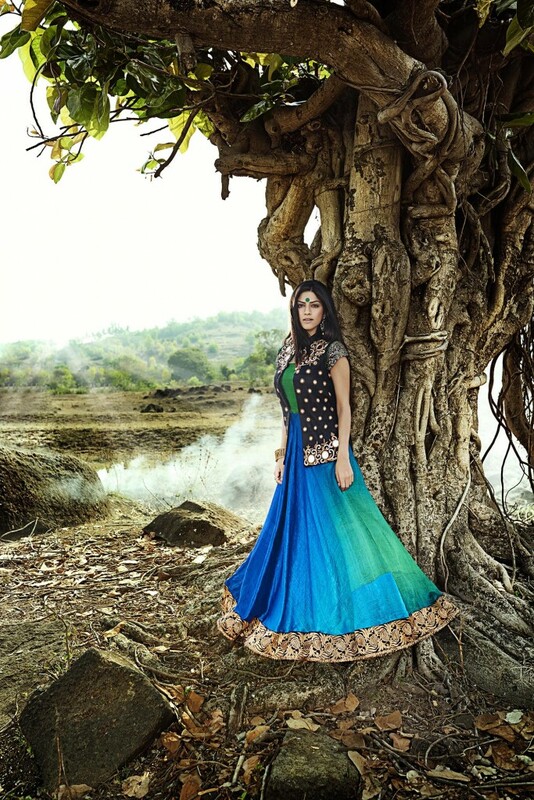 India has dozens of clothing and accessories brands that source and manufacture locally. “Made in India” seems appealing, doesn’t it? Buy good quality clothes and accessories. You bought a cute pair of chappals from Linking Road and a stylish cotton kurta from Lajpat market for a steal. Both get worn out in a few months. And so you want to buy new chappals and another cotton kurta. Instead, how about you pay a bit more and buy chappals and a kurta that last longer? This way you generate less waste and save money in the long run. Think of each purchase as an investment of sorts, and calculate the returns in terms of how long it will make you happy. True, better quality may often mean more strain on your wallet, but when you’re buying fewer clothes and shopping less often, the extra bucks you spend are actually working to save you money in the future. Eat local produce as much as you can. Of course, that’s not always possible. 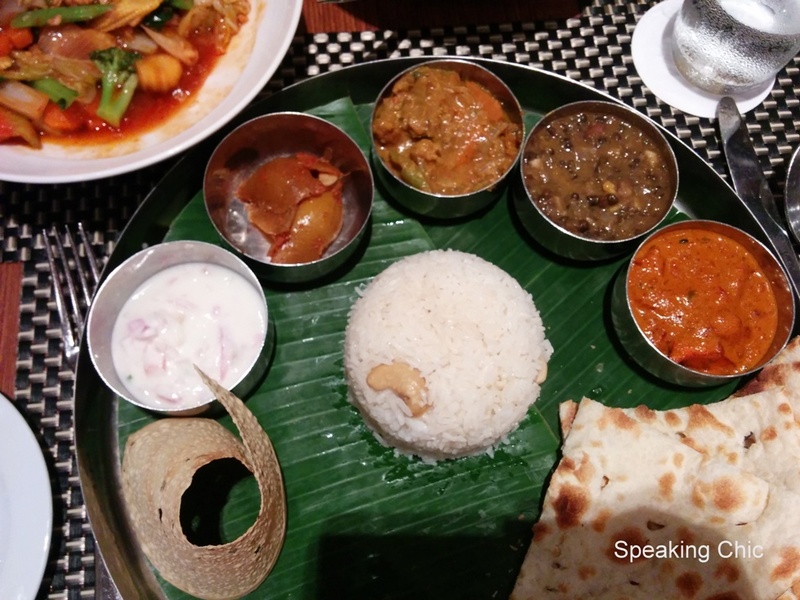 You don’t get great India-made feta or miso paste, but local fruits and vegetables are always the freshest and have travelled much shorter distances to reach you. Besides, seasonal fruits and vegetables are often delicious. So, if you have a choice, buy local. Carry your own shopping bag. A cloth or jute bag or locally made basket is super handy in the market. My granny had gifted my mom couple of hand-woven baskets several years ago which she still uses. Myanmar has some lovely woven baskets as well, and I’ve bought not one, but two of them! Use cloth instead of plastic and paper. Replace kitchen tissue with cloth towels to dry pots, pans and plates in the kitchen, or wipe your hands. There are some “highly absorbent” options which you can use for several days before throwing them for a wash. (Yes, I use just such a towel!). And oh, I prefer to use a handkerchief instead of paper tissue. Reuse (yes, again!). I saw bamboo straws in Cambodia, and regret not buying them. They were reusable and very cute! Conscious foodies often carry reusable cutlery such as forks and chopsticks instead of using the disposable ones found in takeaway joints or fast food restaurants. Use public transport. This one’s a no-brainer. 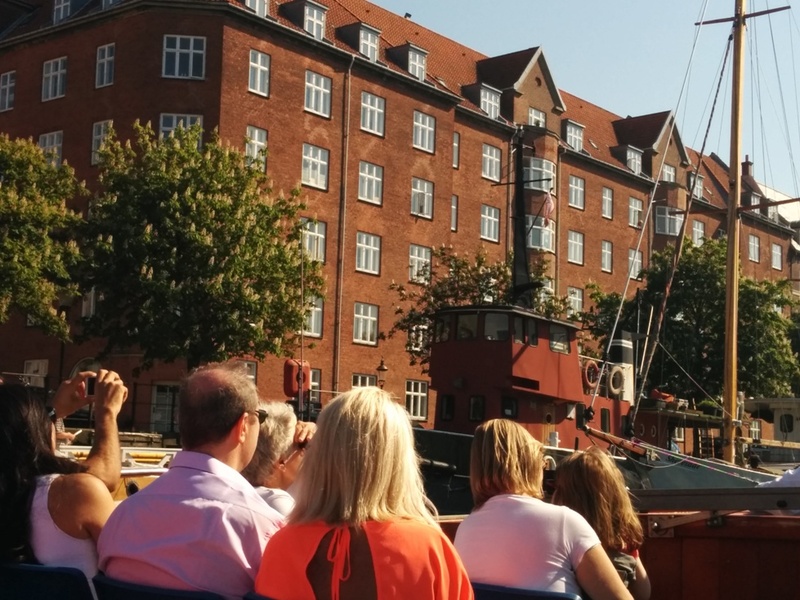 And besides, if you’re using a local bus or public ferry you’ll get a better feel of local life. Better still, cycle around town. Avoid takeaway. Takeaway meals are usually packed in plastic bags and cutlery, thermocol boxes and disposable plastic boxes for sauces etc. Instead, try to relax and enjoy your meal at the restaurant. You’ll savour the food experience a lot more. Book online. And don’t print your ticket, if it isn’t required. Save it on your phone or tablet instead. There are several museums, airlines, theatres, trains and other touristy places that don’t need a paper ticket. We once travelled in an overnight train from Rome to Palermo with the ticket on our iPad without a problem. And when I booked a ticket on the IRCTC website from Vapi to Mumbai, all the TT asked for was my ID proof. Most hotels are fine with electronic booking vouchers as well. Carry e-copies. When my mother and I first travelled abroad in the late 1990s, we were advised to carry multiple copies of our passports, visas and tickets in case something went wrong. Now we save the scanned copies of our documents on email and in our phone’s photo gallery, so it’s accessible even without an internet connection. Do the same. Save paper and ink! Drool-worthy sports shoes are here! There’s been a sudden surge of sports shoes at home recently. Between S and me, we have five pairs of various brands. Throughout my 13 years of schooling, I only had one sports pair: white canvas with laces, which had to be polished with thick and gooey white polish. We called them “tennis shoes”. The few times I did go shopping for sports shoes, we’d fix a budget in mind and make a trip to Vama at Peddar Road. I’d try on a few pairs and then the most comfortable and “sensible” white pair was selected. And then, for many years, I didn’t really need to buy sports shoes (I’ve never been a sporty or running or jogging or walking person). The sports shoes came out of the cupboard for holidays, vacations, picnics etc. And the shoes remained white and nice (and boring) for a long time. And then last year my white Nike pair (with a blue sswoosh) gave in, after several years of faithful service and support, and it was time to go sports shoe shopping again. I had started walking and jogging a bit and wanted good, no, great shoes. But when I went to the mall to take a look, I was blown away. I saw a mind-boggling range of sports shoes- different colours, textures, designs, some with fancy names, some with cool technology… and with several different uses. Shoes to wear with jeans, shoes for running, for walking, for tennis, for football, for fancy clothes… I was spoilt for choice. I finally settled for Reebook’s ZPump shoes in pink. Yes, PINK. And they look great, fit wonderfully, and have been holding me up for very long walks and runs. Meanwhile, S needed to replace his old Puma pair. Again, white shoes, red logo. He’d decided to take up running (completed his first half marathon last week, yay!). S has bought three pairs since last year, two black and one blue, and he’s already looking for the next pair. The transformation of our shoe rack (and our fitness level) has been incredible. We now own a colourful shoe rack filled with awesome-looking sports shoes. Here are some awesome sports shoes lining up the stores these days, each with something “new” to offer, guaranteed to make you stand out in a crowd. 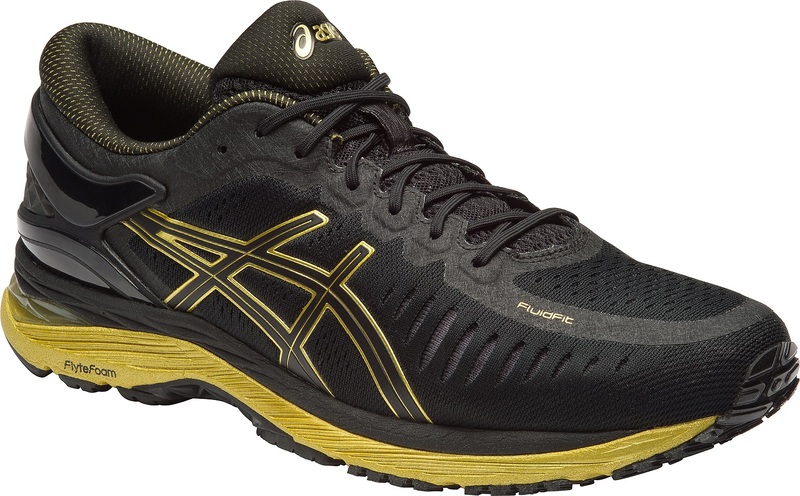 Colour crazy: Boys, make a statement with these black and gold MetaRun shoes from ASICS. 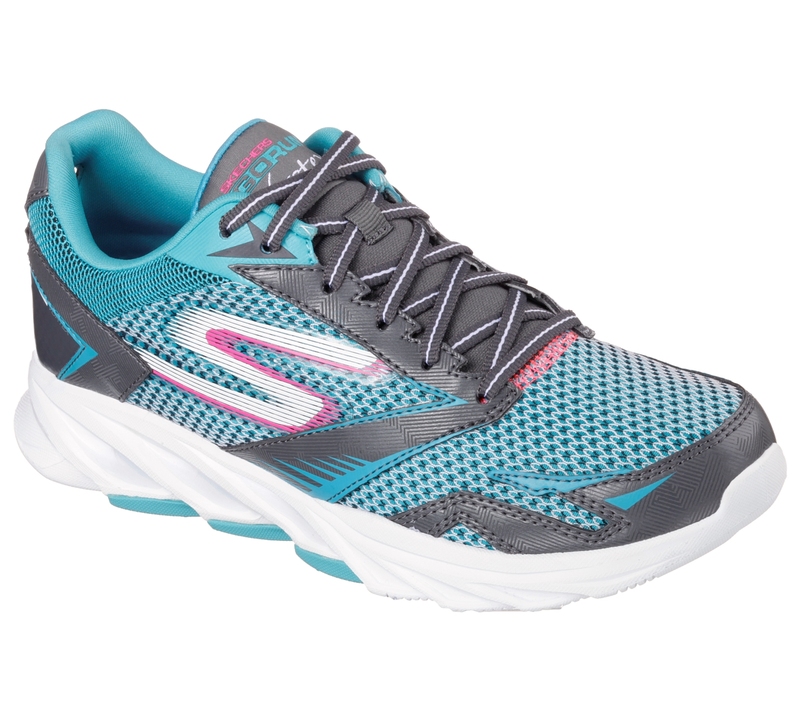 Texture play: The two-toned mesh of the Skechers GORun Vortex shoes look super dynamic on the field. 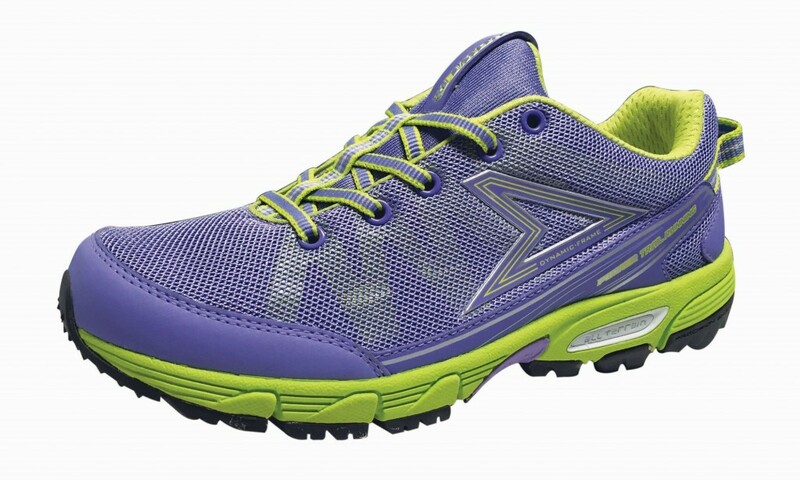 Sporty but feminine: Ladies, here’s the purple sports shoe we’ve all been dreaming of! From Power Shoes (available at Bata). Stars and stripes: When textures and colours abound, can prints be far behind? 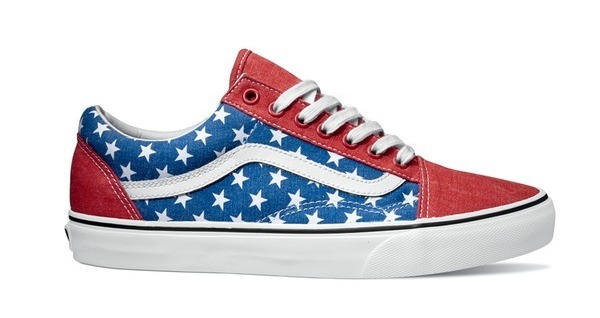 These patterned sneakers from Vans’ Americana collection will go great with jeans. 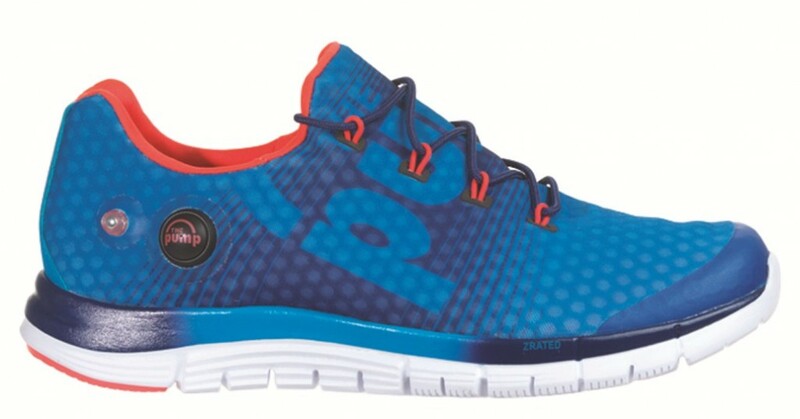 High on tech: You just can’t go wrong with Reebok’s ZPump Fusion shoes (I own a pair!). The shoe molds itself to my foot and use the pump for cushioning and no-pain running. Which sports shoes are you planning to buy? When Sean Penn’s interview with (then fugitive) Mexican drug lord El Chapo Guzmán (or just “El Chapo”) was made public, it was sensational news around the world. 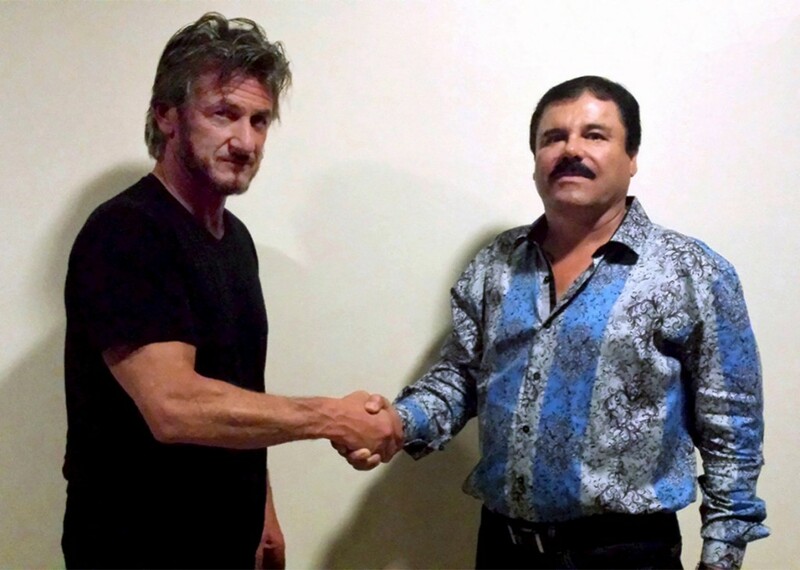 Accompanying the news was a picture of El Chapo shaking Sean Penn’s hand, wearing a printed blue shirt. And then, El Chapo’s shirt was suddenly in demand. But who designed that shirt? And where is it from? This feature from El Pais (a Spanish newspaper) has the answers. Don’t just read it to know about the brand and the designer—think about the bigger picture here. It’s a fascinating story that began with religious persecution, then immigration, and is truly symbolic of globalization, international trade and the fascinating times we live in. It left me amazed (and amused!). Last Saturday, while thousands of people were looking at a photo of actor Sean Penn and El Chapo Guzmán and wondering where it was shot, what they discussed or who took the photo, Sam Esteghball was focused on something else: the shirt that El Chapo was wearing was his. That is to say, the design. Esteghball is the owner of the shop Barabas in Los Angeles, and he had been inundated with emails from customers who had recognised the print and it seemed like they wanted to buy it. Since then, orders have flooded this family business that creates its own designs and manufactures in China. “We have thousands of requests that we cannot fulfill [yet], but we are manufacturing more,” says Sam Esteghball in the store. They placed an order for a few hundreds of the shirts, like they do with all their designs, to sell them through exhibitions and to see how they do in the market. They did not imagine instant success. Right now they are sold out, but Sam assures that he’s been requested [the shirts] for exhibition sales. If one makes an online request, rest assured, the shirts will be here in two weeks. On the internet, there are two shirts El Chapo was wearing- one in the photo, the second in the video. At the entrance of the store the shirt from the photo with Sean Penn is clearly displayed, light blue with darker vertical bands and twig motifs, 100% cotton. It costs $128 in stores, a price that is cheap for this fashion line, according to Esteghball, who assures that it hasn’t risen this week. Sam defines the line’s style as “fantasy”, but the Mexicans know it as “norteño” [Mexican street gang] or “narco” [drugs]. Not exactly. The correct word in Los Angeles for that style is flamboyant. Flashy, ostentatious, garish, that calls for attention. That description is flawless. Barabas is a small store in the well-known “fashion district” in Los Angeles, a euphemism that conceals a sea of warehouses and alleys where clothing business by most of the world and for the world is negotiated. In September 2014, the FBI confirmed that it was the epicenter of drug money laundering. 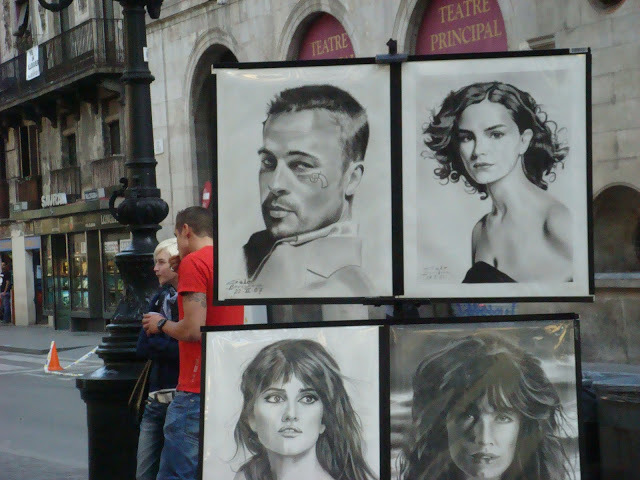 Photos of famous people posing in their clothes adorn the walls of the Barabas store in the city centre (there are two locations). You can assume right away that they have special success in the world of Mexican street gangs: Goyo Gastelum, Andrés Márquez El Macizo, La Banda Jerez, Jorge Gamboa, Javier Rosas y El Komander pose with their designs leaving from the store. “That culture came to us, not the other way round,” assures Esteghball. He started the business with his brother nine years ago and it was around two years ago, he says, that he realized that the “narco culture” world had adopted his shirts, bright pants and safari jackets like those of his brand. They began to be copied by some of the others, he says. One enters Barabas and can leave dressed like El Komander in 10 minutes. They sell clothes to 5000 retailers around the world, which is why Sam says he had no idea where El Chapo bought his shirt, one of the richest men in the world, who could choose Armani, visible from Barabas. The five members of the Esteghball family migrated to California 16 years ago from Shiraz, Iran. They are Jewish and the situation had become very difficult for minorities during the regime of the ayatollahs. Around a million Iranians live in Los Angeles- it’s the largest exile community of Iran in the world, to the point that there is an area called Teheángeles. The sons got into the fashion business because it was what their father did in Shiraz. El Chapo wears narco shirts designed by Iranian immigrants and made in China. That’s what the Republican candidates don’t notice. 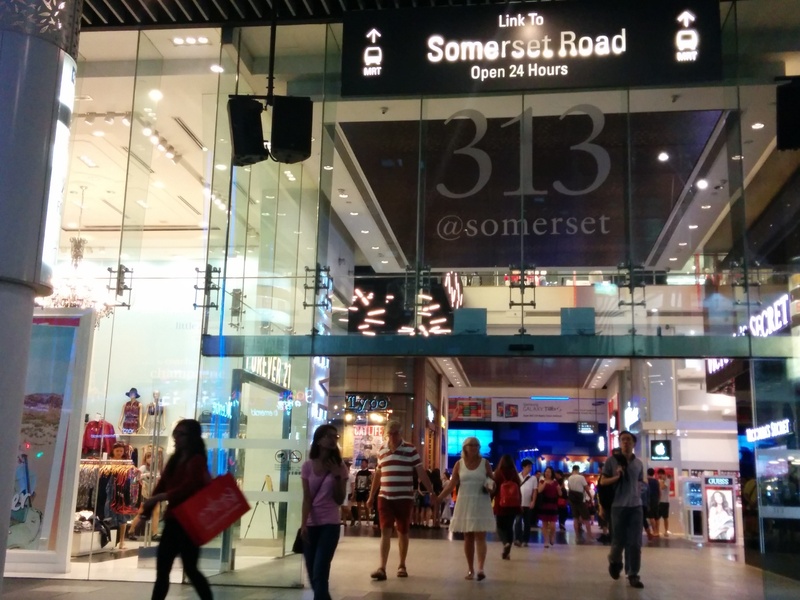 Also read: Awesome shopping streets in Asia. A gorgeous street in Copenhagen, but alas, the shops close by 7 pm and the prices are outrageous for tourists on non-European salaries. 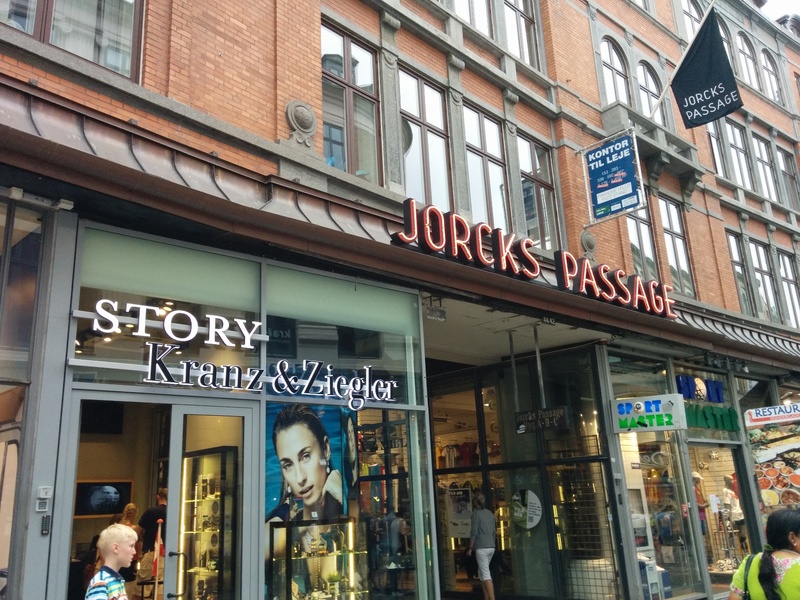 Strøget is one of the longest pedestrian streets in Europe, and is lined with popular high street stores like Topshop, Zara, H&M and some local brands. There’s also a giant Lego store (yay!). 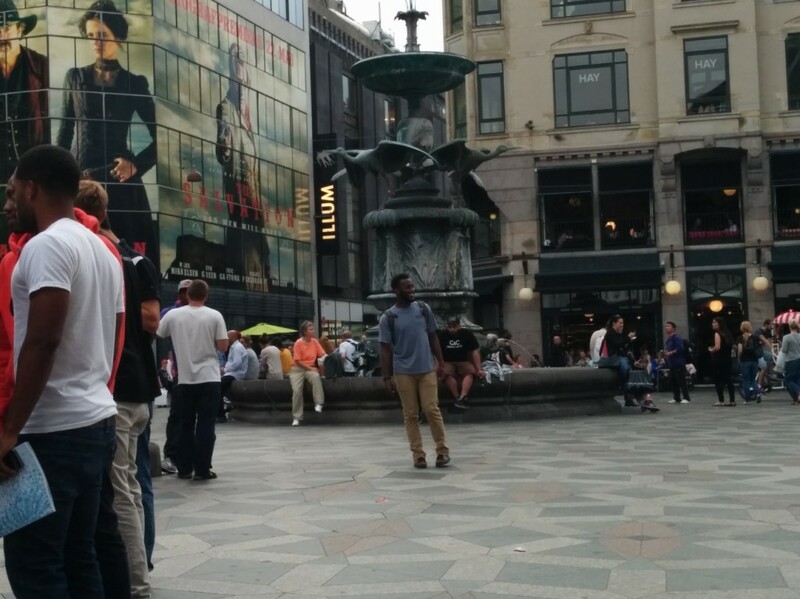 The summer of 2014, Strøget was buzzing with tourists and locals enjoying the atmosphere, sipping coffee at outdoor cafes, and just strolling about. I especially enjoyed the walk on cobblestoned streets and checking out the heritage buildings, still in excellent condition. Back in 2010 when I visited Turkey, the famous Taksim Square was THE PLACE to be on a Saturday night. Crowded even in the day, the place came alive on weekend evenings, with thousands of people partying, shopping and grabbing a bite well past midnight. The streets off the square became a no-car zone, dozens of food and souvenir vendors set up shop and the “party” began. The atmosphere was pulsating with high energy, and I felt like I’d just had two Red Bulls. After a quick pizza, I made my way through the packed streets to go shopping, spending at least an hour at the multi-storeyed Mango store. The best part—shops were open till midnight! PS- Due to the changing political situation in Turkey, I’m not sure if the late-night shopping continues. Who would’ve thought that the staid German capital would have such wonderful shopping! Kurfürstendamm (quite a mouthful no?) 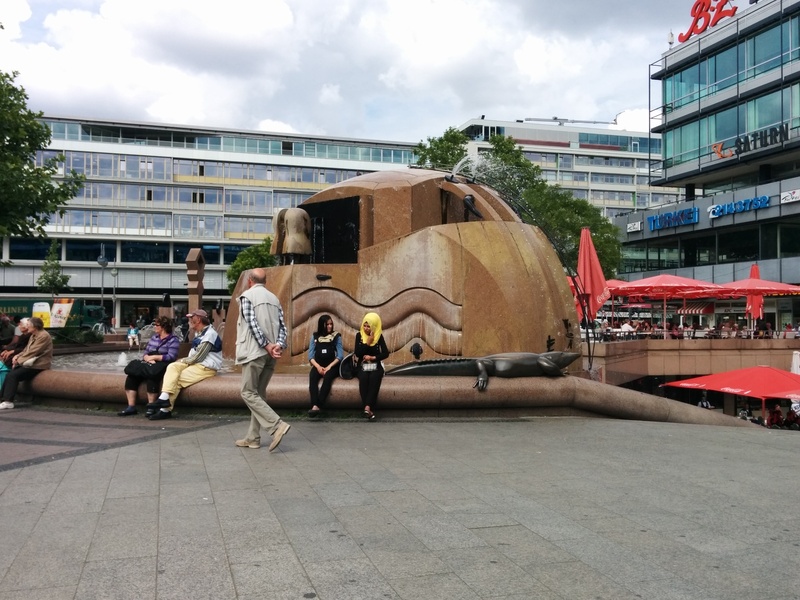 is the center of most tourist activities in Berlin and a great place to shop. 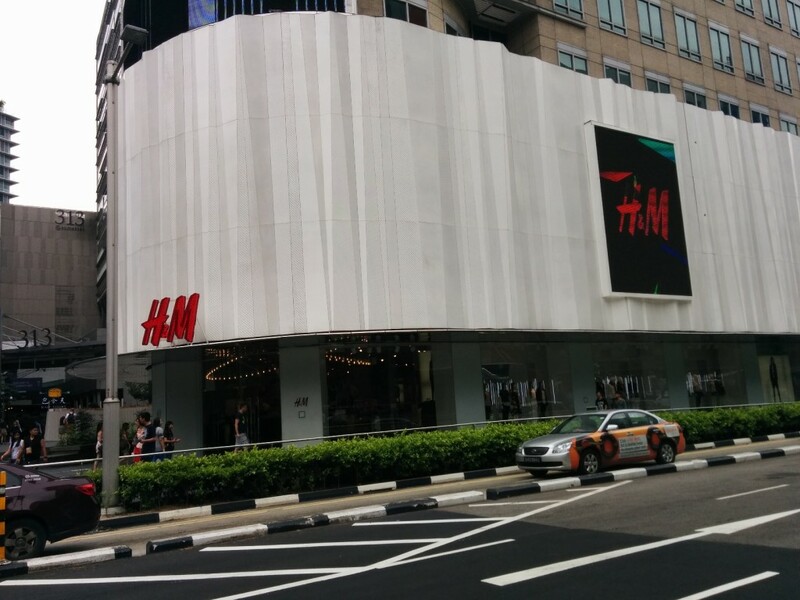 The street has all the high street brands you could name- Zara, Diesel, Uniqlo, H&M, Pull & Bear… you get the idea. I shopped till I dropped at Pull & Bear, and got a great leopard print backpack from Zara for just €10. I also bought kitchen appliances at the German department store KaDeWe, which was stocked with unbelievable appliances in the German aesthetic: clean design and high-tech precision. Also the souvenir shops are worth checking out for cool tees, shot glasses and Berlin messenger bags that look great and are easy on the pocket. Being in Spain, you expect to see local fashion brands at every corner. And well, they are! In and around the 1.2 kilometre-long La Rambla, you have the choice of the world’s best-known fashion and beauty brands, and you will never want to stop. I shopped at Zara, Mango, H&M, Bershka, The Body Shop, Shana… This was in 2011, and the Euro was not as frightfully expensive as it is today. At the Plaza Catalunya end of the street (north end), there’s the Spanish department store El Corte Inglés, where I bought Bobbi Brown makeup and tons of accessories. 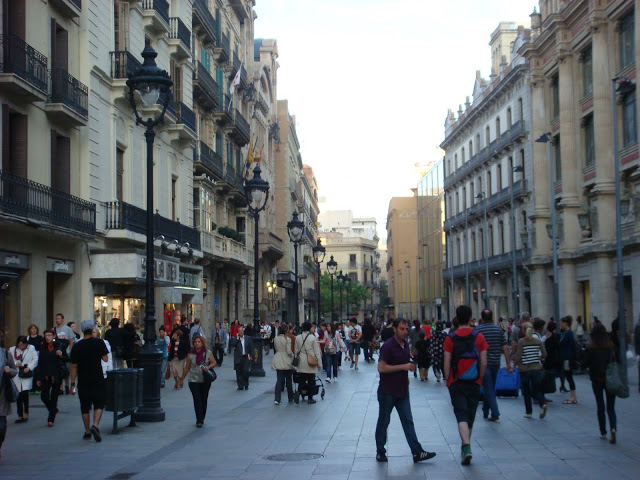 El Corte Inglés is a quintessential part of the Spanish life and each store is different from the others. It’s a must-visit anywhere in the country. I’m an SRK fan, so despite the wonderful reviews (heh!) 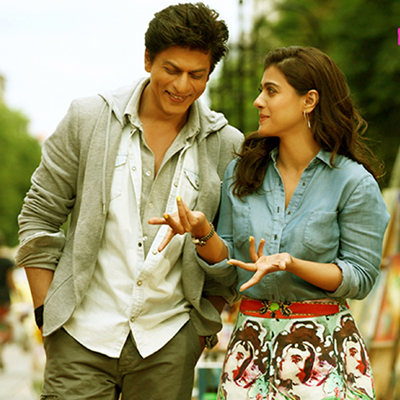 by critics and FB friends, I headed to downtown Yangon to watch Dilwale last weekend. The show was housefull and ticket scalpers were making good money. 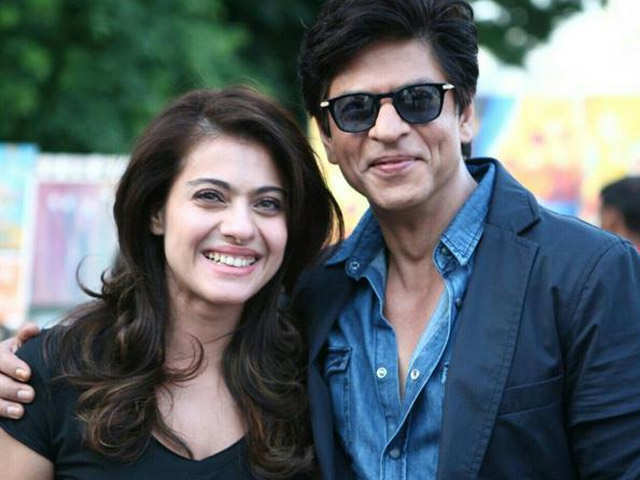 I was mostly interested in the Kajol-SRK on-screen romance, and their crackling chemistry and emotive eyes are the only bits of the film that I liked, even though it was shoddily scripted and directed. Anyways, somewhere amidst the plot twists, overtly-comical characters and extreme suspension of disbelief, I picked up some fashion tips from Shahrukh Khan and Kajol (or Kaali/ Raj and Meera). Even if you abhorred the film or won’t watch it for a million dollars, these style lessons will hopefully inspire a tiny style upgrade or whole new look. BTW, there is not one, not two but FOUR costume designers credited in the film so I have no idea who did the clothes for Shahrukh Khan and Kajol. If you do, let me know! Jackets that match your shirt are the ultimate cool in men’s fashion. Just like what SRK’s wearing in the Bulgaria flashback. I say it’s the “ultimate cool” because it looks oh-so-mature and contrasts is so college-boyish (remember Kuch Kuch Hota Hai?). 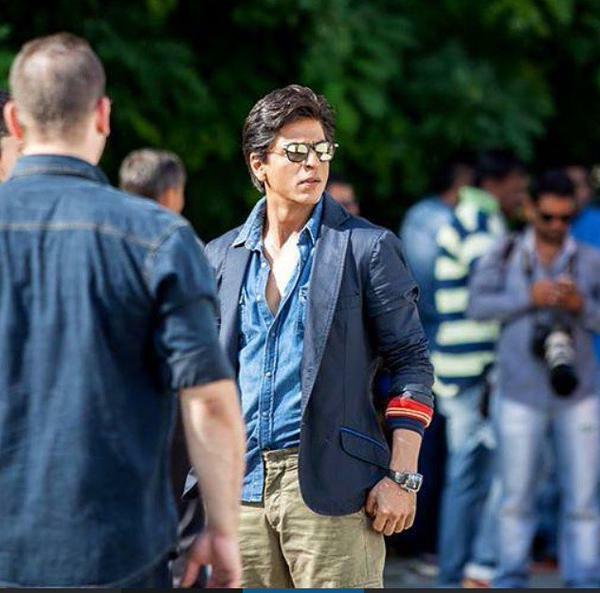 SRK sticks to black, grey and other muted colours, portraying a very chic European look. So skinny jeans are all about showing off your shapely legs and there’s no doubt that SRK is superfit. But he’s dunked skinny jeans and chosen to wear straight fits instead. Why? Here’s a secret: skinny jeans are on their way out the trend door, especially since everyone and their grandma is wearing them. Meanwhile, jean legs are getting wider for both men and women and straight-fit denims or a slightly-flared bootcut is what you should wear like, right now, if you want to be fashion-forward. What do you do when you’re heavy in the lower half, but still want to look great on screen? One, you create the illusion of a waistline, and two, you go for longer lengths. So Kajol’s worn some gorgeous printed midi skirts- they cut off at just the right section of the waist, and they draw attention away from the bottom. Paired with blouses and sky-high heels, Kajol is rocking these skirts. 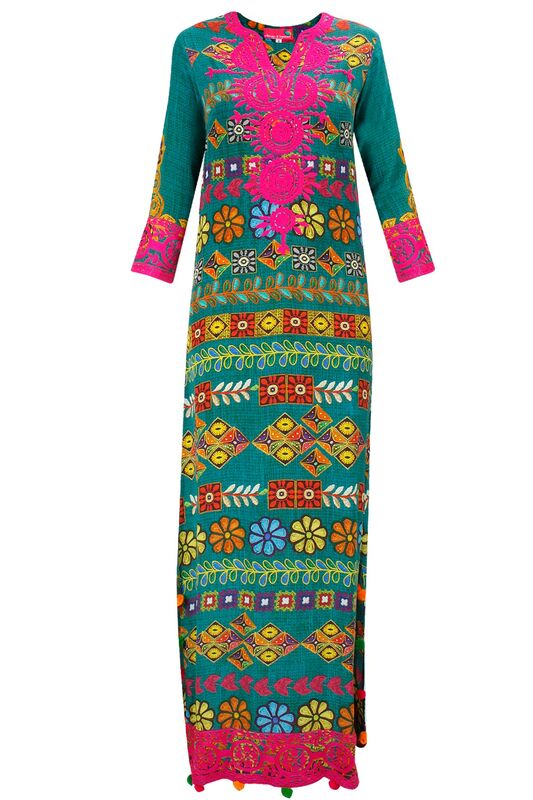 And oh, she wears a printed maxi dress in a Goa scene. Fabulous! I’ve always thought smart buttoned blouses to be a highly underrated garment. It makes anyone, and I mean anyone, look feminine, sophisticated and classy. If the blouse is a solid pastel, even more so. I especially loved Kajol’s gold-smuggling accident outfit- jeans, light peach blouse and matching open cardigan. 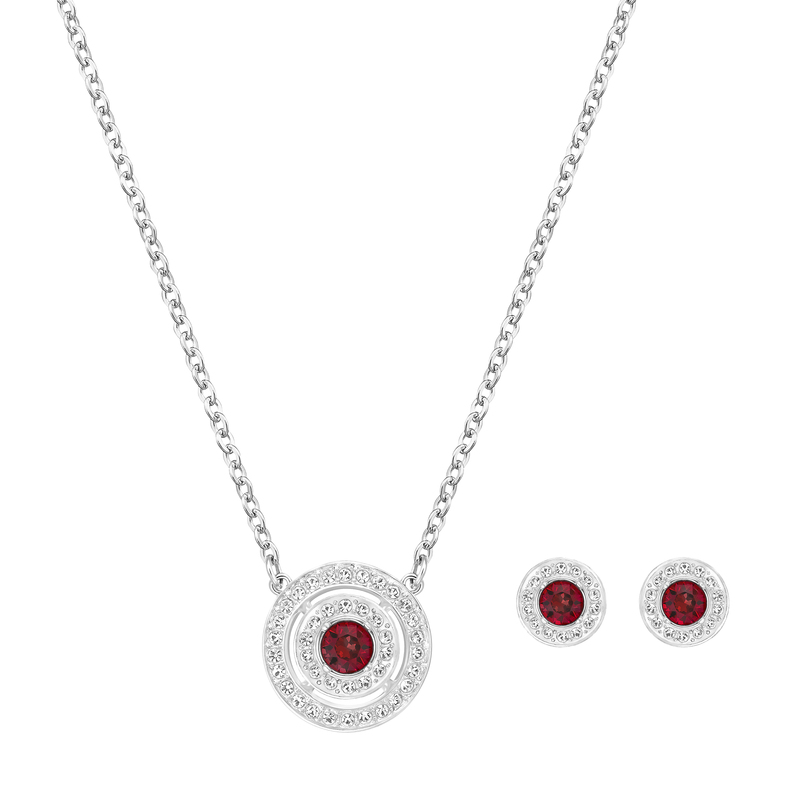 Paired with a strong lip colour and pulled-back hair, it’s an easy peasy way to elegant style. When in Europe, dress as the Europeans. Their colour palette may seem more restricted than ours, but even neutral tones can translate to great clothes if you pick the right garments and style your ensemble well. While SRK sticks to black and greys, Kajol opts for light pastels and blues, though she also adds some colour with her printed skirts. Alas, the colour scheme changes drastically when they move to India (including the set design!) and the tad bit of tastefulness disappears as dozens of bright colours pop everywhere, even in SRK’s garage. Too many colours. Sigh! And then one day SRK heads to church in a parrot green shirt with matching jacket. Urghhh…. Why, why, why?! Chiang Mai, located in Northern Thailand, may not be a beach destination like Phuket or Krabi, but it’s developing into quite a cultural hotspot. 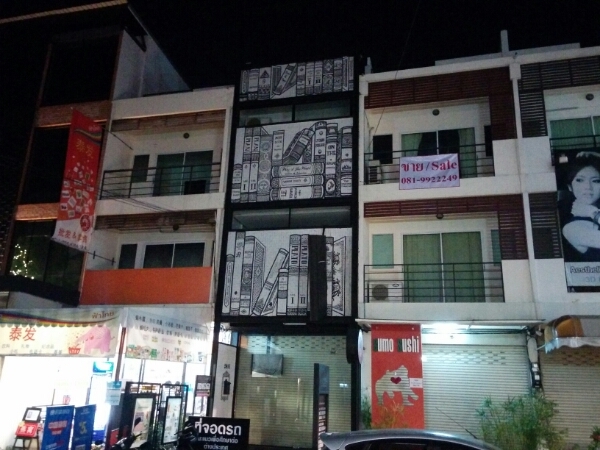 Nimmanhemin Road is the city’s chic quarter, with art galleries, decor stores, indie boutiques and, of course, a vibrant night life. This building had an attractive facade. 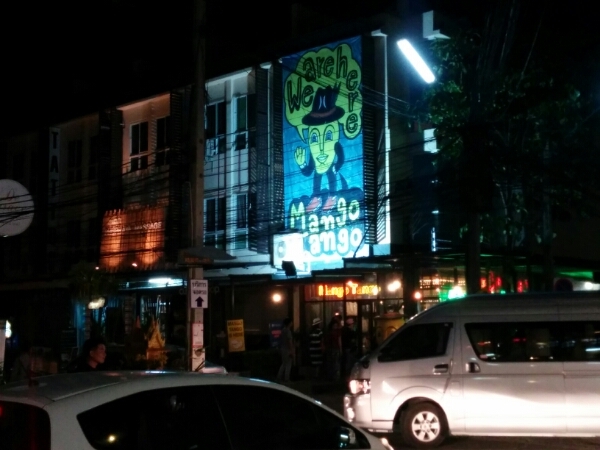 And another building round the corner that housed a cafe (Mango Tango) had a very creative form of advertising their location. If you’re in Chiang Mai, don’t forget to visit Nimmanhemin Road and explore the sois (lanes) that lead to spas, cafes and restaurants. There’s so much to see! Of course I can’t try all of these ideas, but a girl can dream, can’t she? 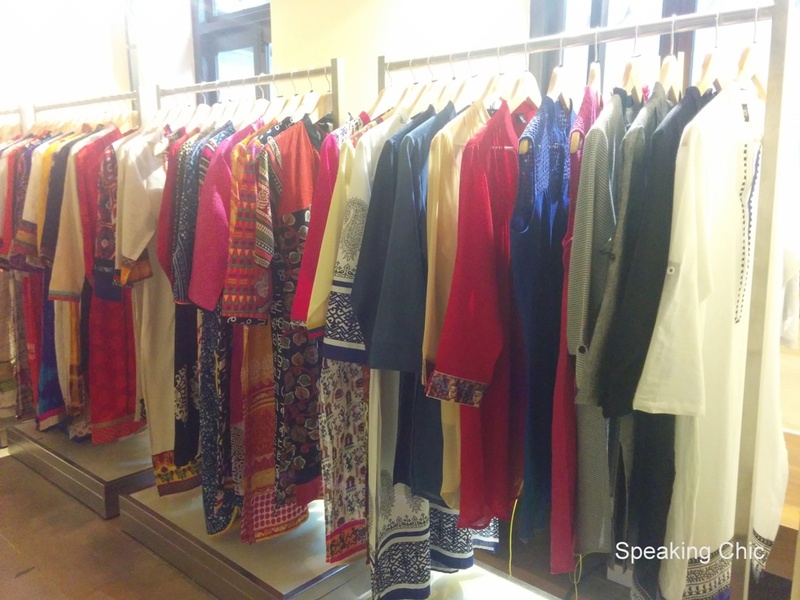 It can be short like a waistcoast or long like an anarkali, it could be embroidered or block printed… “A plain kurta paired with a printed or embroidered short jacket is the perfect alternative to a dupatta,” says Rahuul Jashnani, managing director of Jashn. “Button it or just let it loose, or wear it on your sari for a bold and edgy and daring look.” I agree. If you’re a vertically-challenged like me, then long silhouettes can be quite exciting. Plus longer the length, the grander you look, and the more elegant you feel. 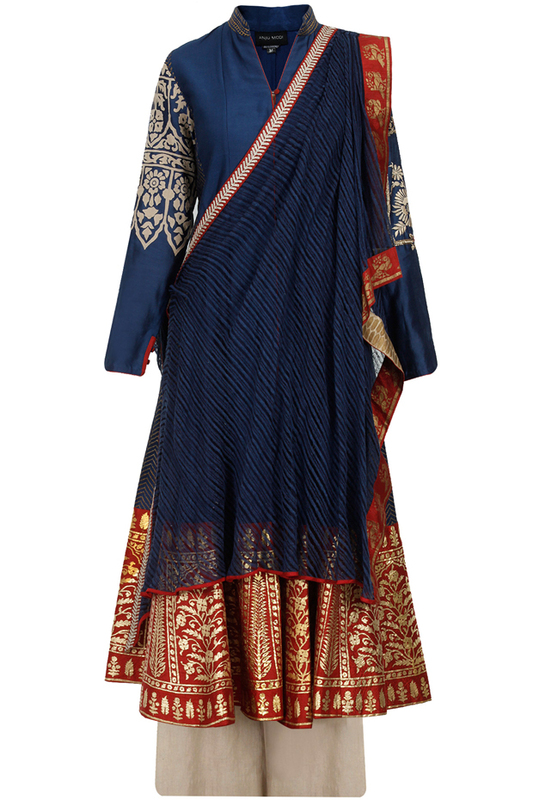 Gota, bandhini, leheriya—our cultural heritage has plenty of fabric, print, texture and embellishment options to choose from. I’m moving on from mere contrast dupattas. I’d rather wrap a stunning dupatta around me to draw the attention. I’m in love with these ones from Gaurang, or something embellished-border like this one below. 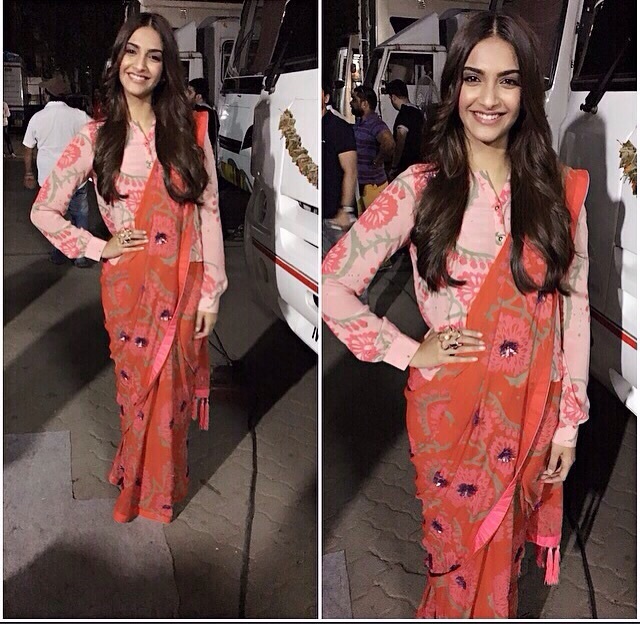 It may seem that only Sonam Kapoor can pull off a shirt with a sari. Maybe yes, maybe no. Well, we won’t know till we try it, right? I’m not even talking about Gwen Stefani here. It’s Indian, so why not place a cute bindi on the forehead? So feminine! Gold and white are a classic combo, but well, it’s a little safe. I love admiring jewellery with coloured stones- blue, pink, green…. 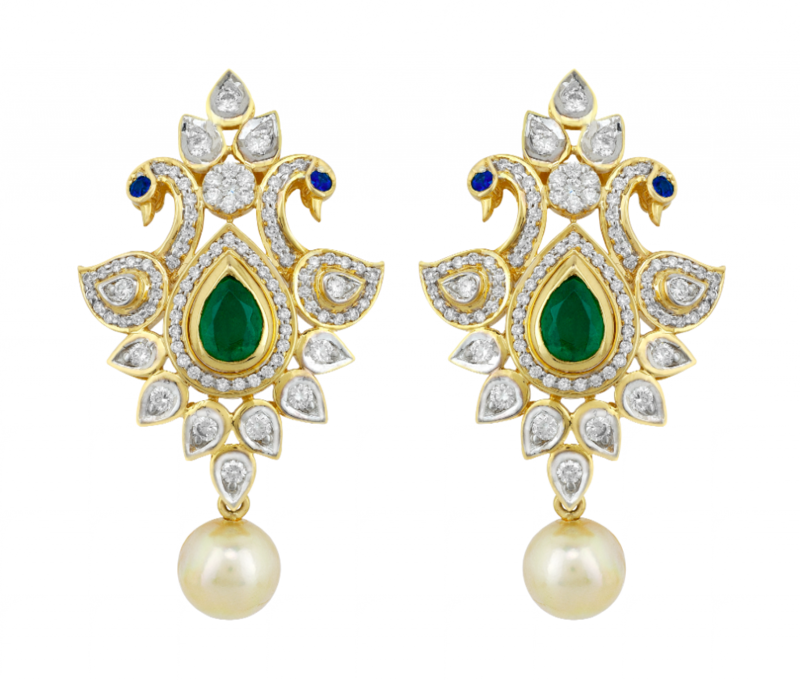 “A mix of diamond, polki and jadau jewellery with bright colourful gemstones in innovative ways and eclectic styles add appeal to any outfit,” says Aakas Barmecha of Yoube Jewellery. Which stylish idea or trend inspires you most this Diwali? Shopping (and window shopping) is one of my favourite things to do when I travel to a new city or country. It gives me a feel of the local fashion, an opportunity to discover ideas for new looks and a sense of how the people there like to dress. I particularly enjoy walking through shopping streets because they’re so much more fun than malls. You get to the see the neighbourhood, the city’s architecture and of course, street life. 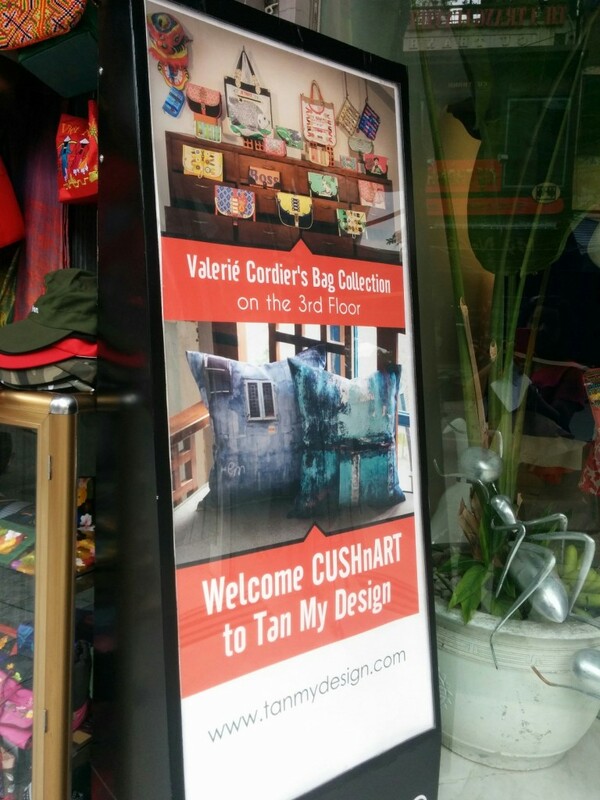 In this two-part series, I’m listing my favourite shopping streets. 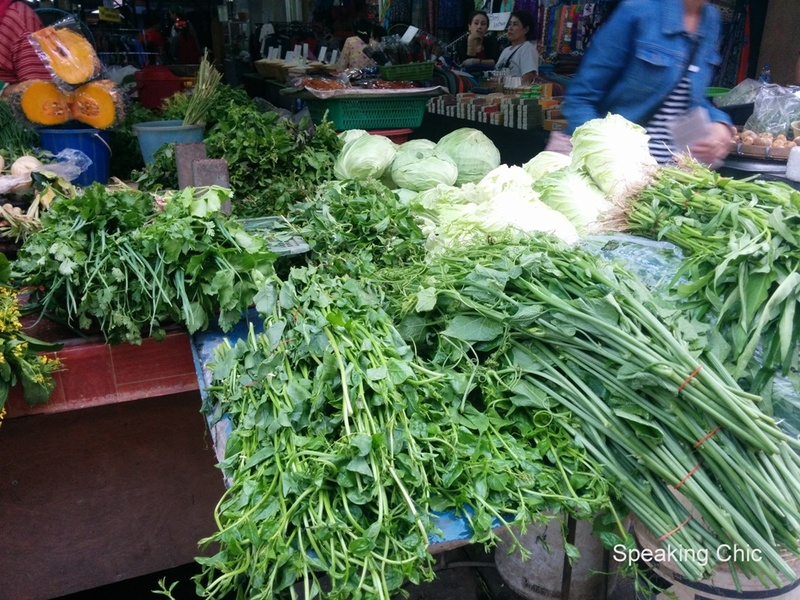 The first part covers my favourite shopping streets in Asia. 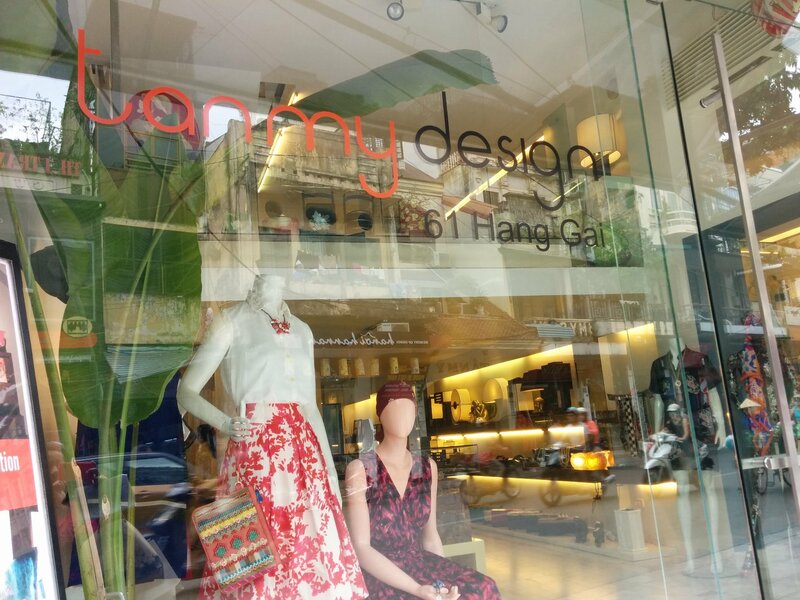 Hanoi’s Hang Gai has everything a fashionista would want: cute boutiques, chic souvenir stores, French-style cafes, local art stores and even a tshirt-only store. I shopped all of these on Hang Gai and in the neighbourhood, stepping into side streets to discover embroidery stores, handcrafted goods and lots of silk! My top buys: A tongue-in-cheek Hanoi tshirt from Ginkgo (local fashion brand) and hand-embroidered pouches. 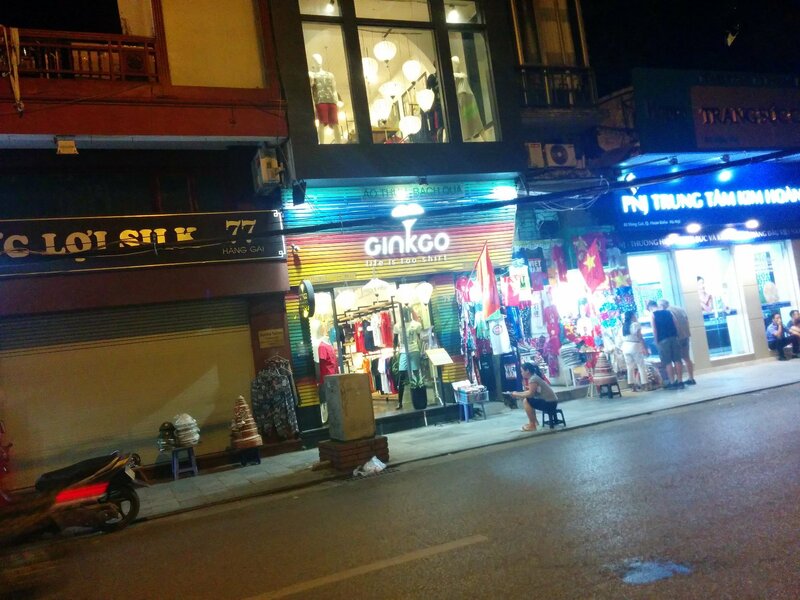 Browsing at local boutiques in Hang Gai and Hang Trong for clothes and accessories is highly recommended! You may just stumble across some unique finds. 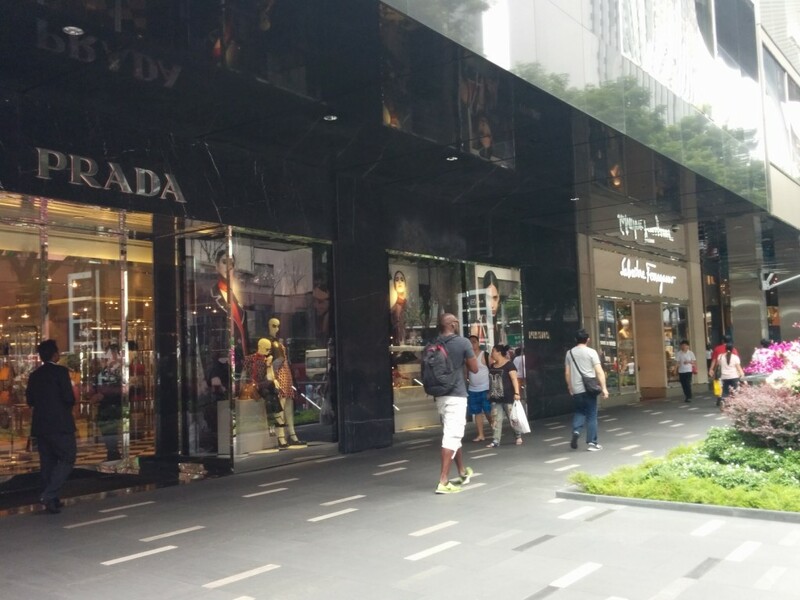 Orchard Street is anyone’s dream destination to shop in Singapore, and the craziness begins when you step off the MRT. I bought two pairs of shoes right at the station even before I hit the shopping street above. 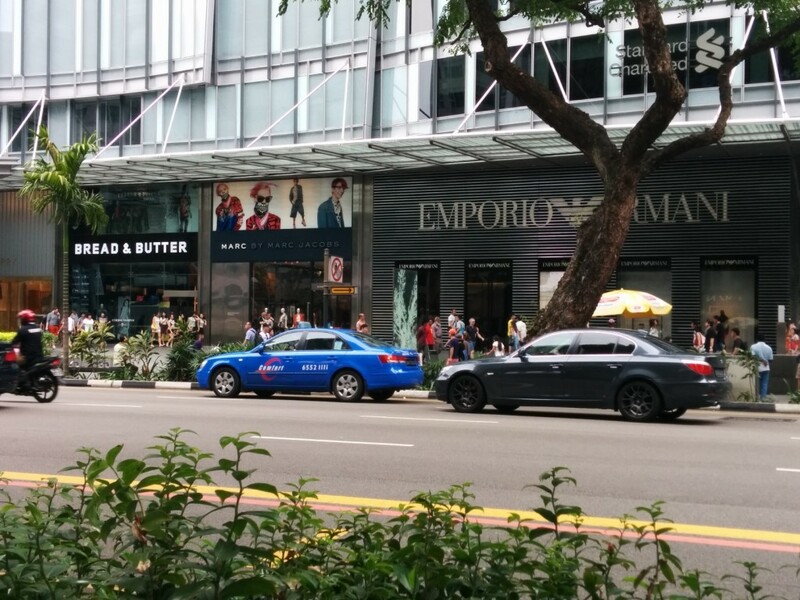 😛 The good news is that Orchard Street has a range of malls to suit different shopping budgets. The bad news is, you want to go everywhere. 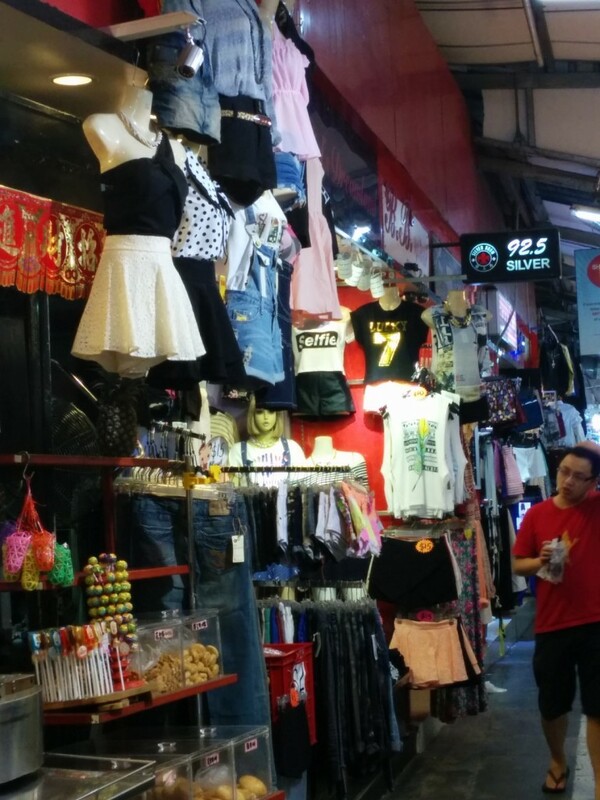 After a lot of disappointments at Orchard Street stores (international brands were cheaper in India and H&M was a disaster), I finally discovered a store at 313 Somerset called Valleygirl that had trendy dresses and tops at moderate prices. Yep, two places in Singapore! 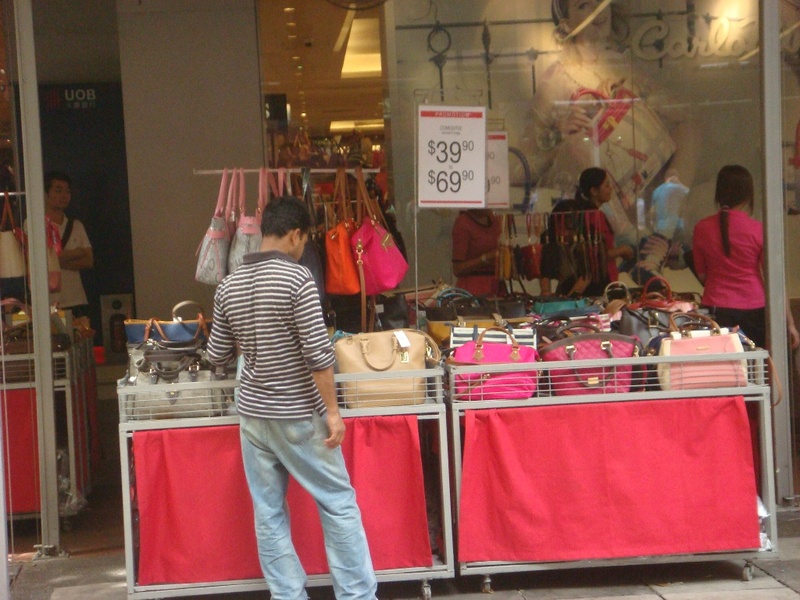 Bugis Street is a delight if you want to hog while you shop! I shopped there late evening, and bagged cool bargains on tops, lingerie, nightwear and souvenirs. Then we had a very Singaporean snack right on the street- the icecream sandwich. 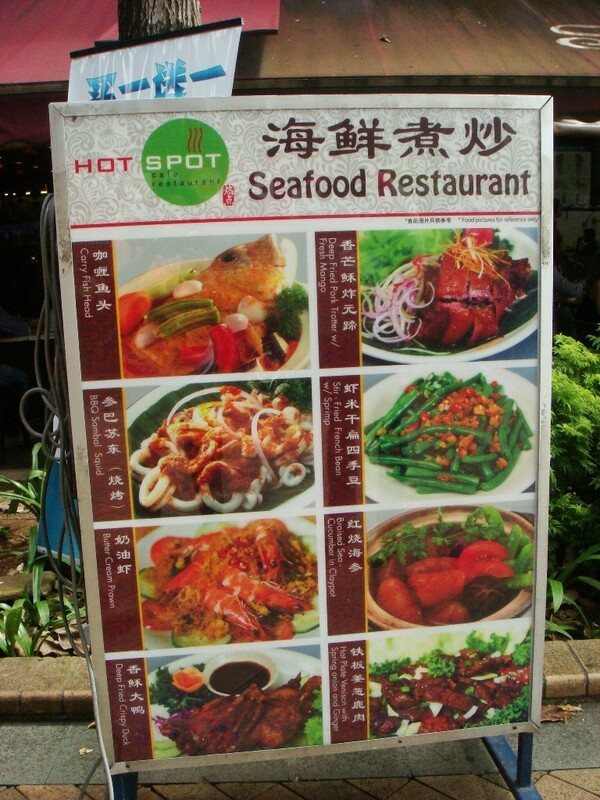 The restaurants on Bugis Street serve good local fare as well. 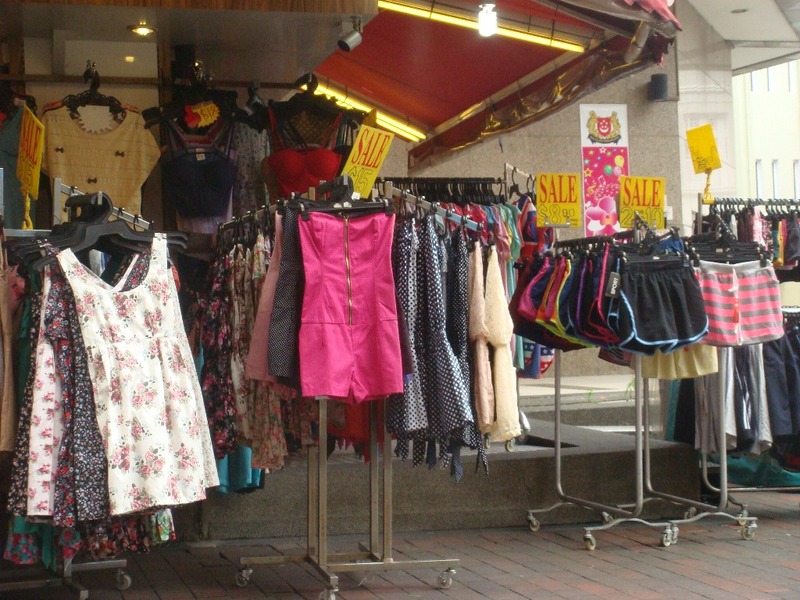 I didn’t venture deep inside the market, which is where the best deals are to be found, but the street-facing and ground floor shops have some great deals! 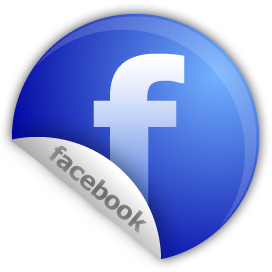 Hi, I'm Rohini, and I'm a content writer born and raised in Mumbai, India. I live to eat, read, write, cook and dress up (not necessarily in that order!). Write to me at speakingchic[at]gmail[dot]com for any feedback or if you would like to know more about my content services. 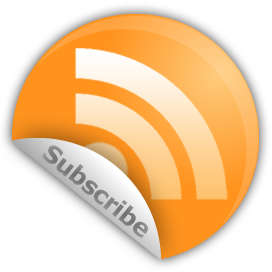 Read more about my content services. Enter your email to get all the awesomeness from Speaking Chic. And yep, no spam! 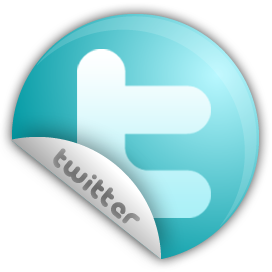 Blog posts marked Chic Promotion are sponsored by brands or blogging networks.